Tool carriers are not just for garages anymore! ...on my antique shoe cart. Do I have too much ironstone?? Want to see more of my dining room? You can never have too much ironstone! Love the toolbox and it's pretty display! Great shots of your dining room! Love your toolbox with the itonstone and your collection. Too! Too much ironstone?? Never! Nice tool box and great price. I found an old shoe cart the other day with six shelves, but the price was almost $500 so not happening. Your tote is perfect for storing your ironstone. Never too much!! And the tote looks great on top of your shoe rack. i love these rustic gems! Amei essa caixa de ferramentas. Meu marido tem uma e não quer me dar pra fazer um vaso de flor.Ficou lindo como porta pratos. What? Can one have too much ironstone? I certainly don't think so! The tool box is a great idea for storing these plates. Looks right at home in your lovely dining room. Your toolbox toting your ironstone is gorgeous. And no, one can never have too much ironstone! I love your tool carrier! There can never be too much ironstone! Everything looks great! That looks great~! I love it. I have one and you have given me some good ideas for using it! Great blog too. I love everything here, but I'm really digging that mirror with the old frame! I have a really huge old one just like that, I may have to borrow your idea! How are you my BFF? I love that carrier and NO! you do not have too much ironstone. I don't have a tool caddy like that one. I really like yours. They can be used in so many ways. I can't wait to see your dining room reveal with it's new color! Love your tool box, but totally love that old shoe cart. I really would love to have one of my own. Your DR is beautiful. Nice, Marcy! Great combo. Hang on to those dishes...you'd cry if you got rid of them. Gorgeous! 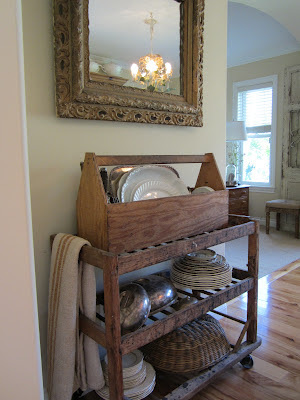 I love the way your ironstone looks in your hutch, too! Your shoe cart is awesome! And a girl can never have too much ironstone! What a great size that tote is! I think they look wonderful filled with dishes and silverware. It suits your dining room, too. You have a beautiful dining room! I have a very similar tote filled with white plates, but I love how you added in silver, too. I'm now following and can't wait to explore more of your projects. I love this! There's no such thing as too much ironstone!! I love how you've accessorized the tool tote and made it a functional piece in your dining room. Awesome! Oh I love the rustic elegance! Your plumbers box is splendid filled with ironstone. What a GREAT find Marcy! And you an NEVER have too much ironstone....not EVER! Beautiful room....can't wait to see the reveal! Nope I don't think you can ever have too much ironstone! Love your tote!Perfect on your vintage shoe rack. I bought a similar tool tote from the flea market at the beginning of summer. It has been sitting in my garage because I just couldn't figure out what to do with it. I must use your idea (if you don't mind). I have ironstone plates hidden away without a place to display. What a clever use of your tote! Lucky you! I love your tool box and you've filled her up with lots of prettiness! Never, never! You can never have enough iron stone! It all looks lovely. love the tool tote...I have one by my front door with all my garden tools in it..its a double decker tool tote! Oh Marcy, I truly love your style and home!!! Your dining room is fantastic! I smiled seeing your tool crate- I just sold one this summer in my space. I used it as a flower box! I love the way you displayed your ironstone in it- great idea. I've sold a few of those ironstone pieces recently too. Love it! I love the wooden tray on the dining room table & of course your tool box. a new obsession lol - and your runner is beautiful! by the way, love the cart too. So charming! Sharing at the party tonight- thanks for linking up at Feathered Nest Friday! I have fallen so in love with ironstone.. it just seems getting harder and harder to find the vintage pieces. To set them in the toolbox was utterly charming! A great way to display the "overflow"! I plan on clicking on your tutorial link for the burlap runner as the color and texture create such a wonderful ambiance for your room! Nicely done! I have now become your newest follower and if you get a chance, drop on by my blog. I would love to have you over!!! 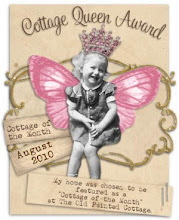 I am a new follower, you have a GORGEOUS house and you show if off beautifully on your blog. so glad I found you! I am a new follower. Found you through French Country Cottage. I love your ironstone. You can never have enough! Looks lovely. I love the idea. Hey Marcy! I mailed your package Friday and they said you would get it tomorrow (Tuesday). Hope it is what you wanted :0. Have a great Labor Day! We were at the lake yesterday and it was beautiful! Today it is raining cats and dogs. It will be a good day to get stuff done INDOORS! So happy to see you back! I hope you had a wonderful break with your family! I can't believe you found that for only $15! What a beautiful home you have! The burlap table runner with the fringe is wonderful, along with all the lovely white dishes. Too many? Is there such a thing? Well not from the outside looking in. You have a gorgeous style. Thanks for stopping by Quirky Vistas to leave me a comment and follow! I can't wait to see what else you have been up to. Love your site! Thanks for stopping by Quirky Vistas and for checking out my project and taking the time to comment!